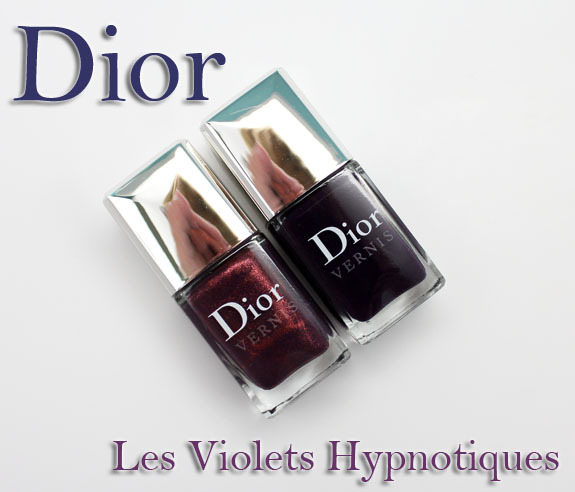 New this fall from Dior is a collection of purple Vernis called Les Violets Hypnotiques. This collection is limited edition and exclusive to Nordstrom (at least in the US). It contains three new purple shades: two shimmers and a creme. The three shades are: Shadow, Poison and Orchid (a plum creme which I didn’t purchase). You will notice that Shadow is obviously super shimmery. Poison looks to be a deep purple creme until you turn the flash on. Then you see very subtle silver micro-glitter bits. But SUUUUUUUPER subtle even in good lighting. 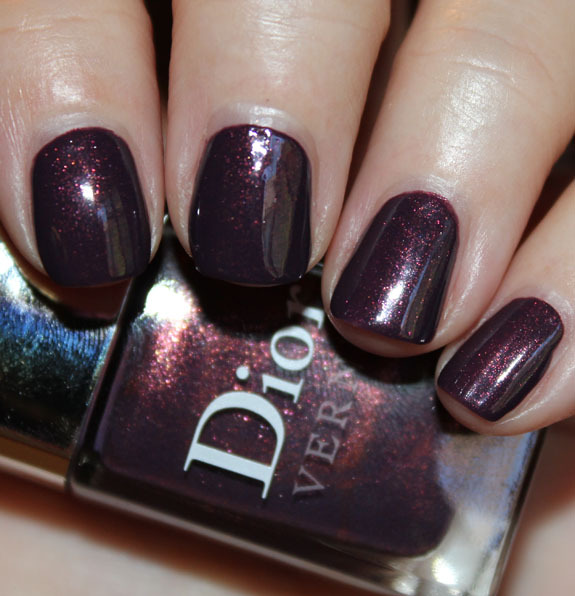 Shadow is a very rich purple base with heavy red and purple shimmer. This is one that really glows and is so pretty. I love purples mixed with red shimmer. The formula was fan-freakin-tastic. Super creamy and easy to apply, and nearly covered in one coat, but I used two. Funny thing about that brush is I am finding I like it more and more. I get better, more even and rounded coverage around my cuticle area than with other brushes that have a flat cut across the tip. So therefore less clean-up in the end for me. 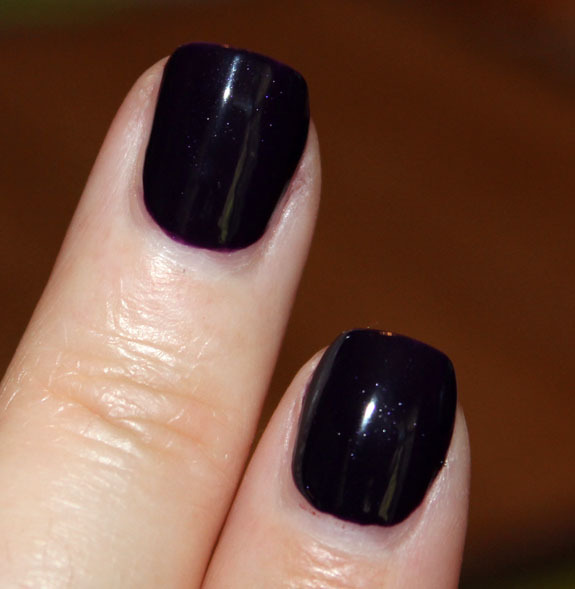 Poison is a very dark vampy purple with really fine and subtle silver micro-glitter. I previously saw swatches of this one, which is why I ordered it, but it looks much darker in person than the swatches I saw. It’s really nearly black, and as mentioned, it mostly looks like a creme. It’s a nice shade, but not nearly as unique or pretty as Shadow. The formula though was just as good, and just two coats. Overall: Both have an excellent formula but Shadow is the one I feel is worth the money. Availability: Nordstrom exclusives and LE. Pricing: $23.00 for 0.33 oz (sob). Do you like Shadow and Poison, or are they just too damn expensive? Note: Honestly I have no clue if they are cruelty free or not. Some places say yes, some no. big Ruby Nail Tattoos Giveaway! Shadow is my favorite of the two – but they are out of my price range. I’m tempted to buy Shadow just because of the name, our old Golden Retriever of 14 years was called Shadow. It’s also a gorgeous color to boot! I did say tempted though. They’re still waahaaay out of my price range. Oh shadow is very very tempting, but too expensive. Like the others, I love Shadow (we have a cat named Shadow but he’s black, not purple with shimmer! ), but it’s just way out of the budget for now. I love shadow. It’s a really pretty shade. I think it’s the only one worth the price. But the bottle is soooo small for the price. Think I’ll pass until the next collection. 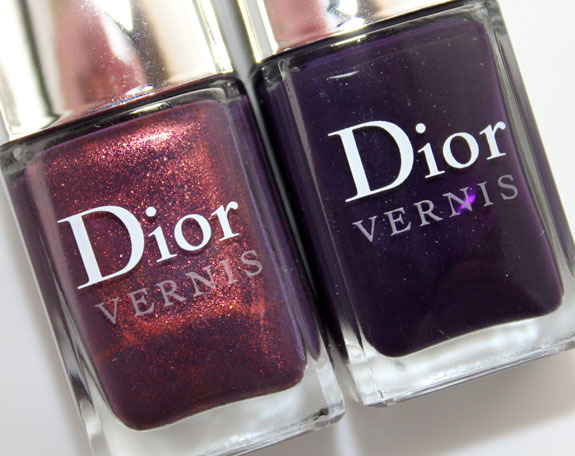 I love these, have these, and have a serious Dior addiction. The brush (I have wide nail beds and big hands) is perfection for me. I like Shadow better than Poison, but not enough to shell out that kind of cash. When Chanel Peridot came out (and there weren’t so many dupes), it took me a while, but I shelled out for that since I thought it was special enough. MAN does my wallet hate you! (No offense, it hates me too, LOL.) I want BOTH of these! 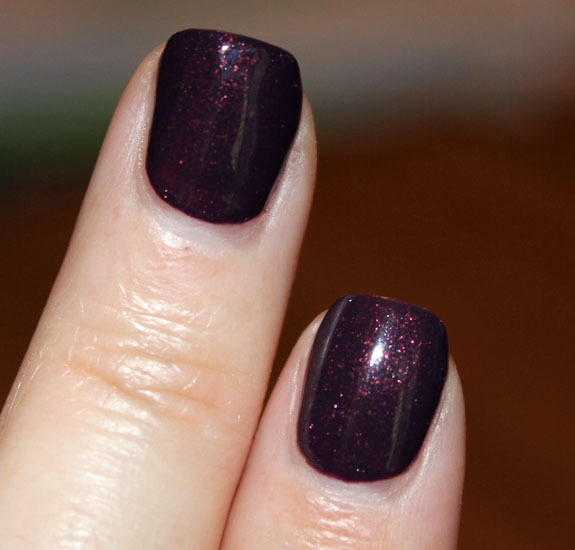 Purple is my favorite color; I love purples with red shimmer especially. I really like the Dior brush, too, always have. Shadow is beautiful but out of my price range; looks like it’s easily duped, too. Thanks as always for your gorgeous swatches! Shadow-honestly-looked prettier in the BOTTLE to me! 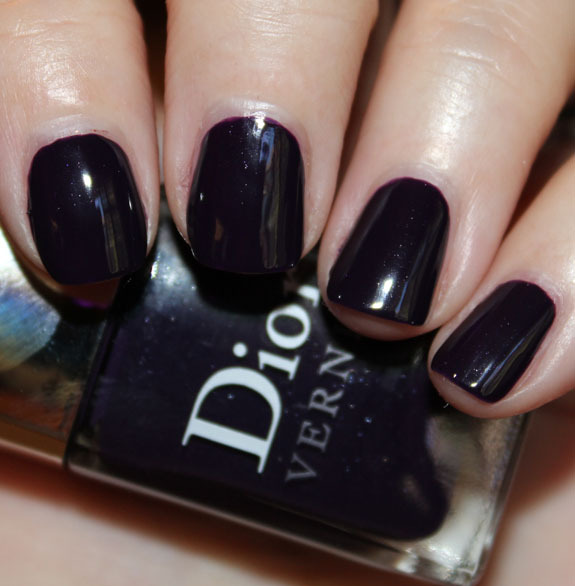 I’m tempted by Shadow… I’ve never owned a Dior polish because of the price tag though. I’ll shell out $14 for a pretty Butter London polish in a heartbeat, but $23 is pushing my wallet a little too hard! I am tempted though… it is gorgeous… agh! 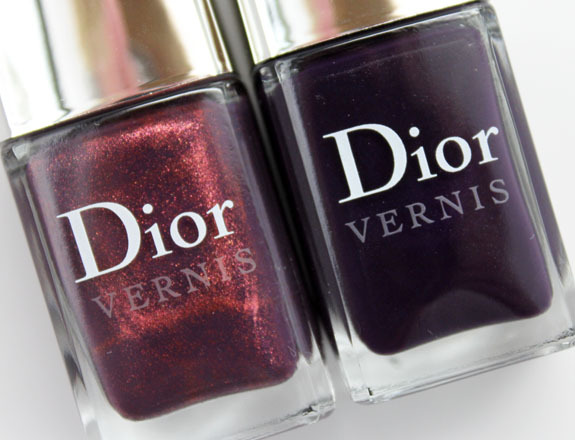 I love both of these and they are already in my stash…I can’t resist Dior polishes and I too have grown to really love the brush….although I find it harder to use for a pedi. Nice swatches. I voted yes just because these are shades that I love and would wear. I wouldn’t have found them that pretty in the bottle but on your nails, yummy!! Shadow is positively yummy! If I had to pick one shade out of this collection that would be it! Sunny @ Mostly Sunny´s last post…Getting to Know Estee Lauder & the Makeup Tips I Learnt! Shadow is gorgeous but poison is kind of meh to me. I can’t justify spending $23 on a bottle of nail polish, so I’ll just have to admire these from afar. Wow, Shadow is one of the most unique and stunning shades I have ever seen! Oy, that price tag :(.